SENTIO… UT POSSIM TOTUM MUNDUM CONSUMERE IGNE! ITA, FILI. ET SIC CONSUMAM. NATUS ES PRO INSTRUMENTO VOLUNTATIS MEAE. CONSILIUM PERFECTUM ERIS, PROPOSITUM GRANDE PRAESTARE. I FEEL… LIKE I COULD BURN THE WHOLE WORLD TO THE GROUND! YES, MY SON. AND SO YOU WILL. YOU WERE BORN TO BE AN INSTRUMENT OF MY WILL. AND YOU SHALL BE THE PERFECT VESSEL TO FULFILL MY GRAND DESIGN. WE SHALL CLEANSE THIS WORLD TOGETHER. Well… at least it sounds like things will be cleaner… That’s good, right? 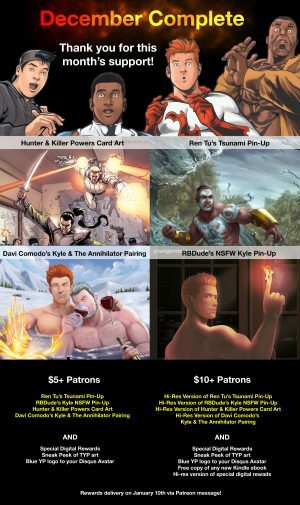 AND here are the Patreon rewards for December! So! Kyle sounds like he’s feeling his demonic oats, Laampros is looking to get a jump on spring cleaning, and Tsunami says he can’t hold it together much longer. Will Kyle decide to burn the whole world to the ground? What is Laampros’ “grand design” and does he have not-so-grand designs he’s holding back on us? And what exactly is Tsunami losing?